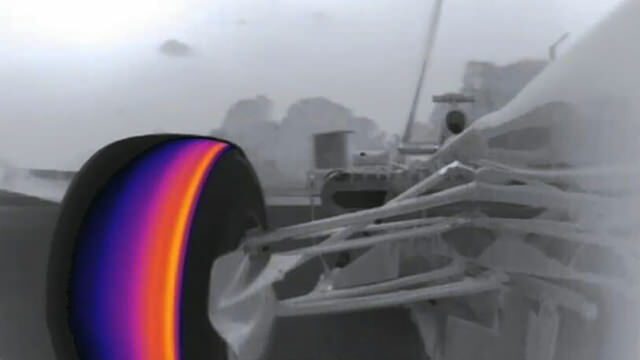 F1 fans tuning in to Friday's free practice session in Monza were treated to a unique view of their favourite cars thanks to a new kind of thermal imaging display. 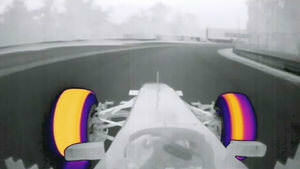 Infrared technology has been used by the sport to bring fans closer to the action since 2008, but this is the first time we've seen them attached to cars before. Cameras were outfitted to at least two cars, Paul di Resta's Force India being attached with a forward facing lens behind the cockpit, while Pastor Maldonado's Williams featured a camera on the front wing pointing backwards towards the rear of the car. With tyres proving to be a key discussion point throughout this season, the additional perspective that these cameras offer provides a very visual means to understand just how hard the rubber is working at any given point. Fans have repeatedly been teased with interesting and exciting new technology that appears to enhance the viewing experience only to see it vanish into the ether almost as quickly as it arrived. It is not clear whether this one is a keeper, but from what we saw today it should be.